Taking the center stage is a monster-sized copper cask marked with the letter R (for Reserve), where roasted beans rest for a few days to unleash their qualities. If Roald Dahl’s character Charlie Bucket were a grown-up, this is where he’d get his java. “I said: ‘Liz, let’s build the ‘Willy Wonka’ of coffee,’ ” Starbucks CEO Howard Schultz told a group of investors and analysts on Thursday in Seattle, recalling a conversation two years ago with Starbucks design guru Liz Muller. So the company needs to diversify its offerings and lure customers not only during the morning but throughout the day. For example, it plans to double the revenue it gets from food in U.S. stores to about $4 billion by 2019. It also plans to roll out its Starbucks Evenings program — featuring beer, wine and tapas — from about 30 stores to 3,000 in the United States. Starbucks executives also acknowledge the need to constantly invent alluring experiences to draw customers out of their online shell. 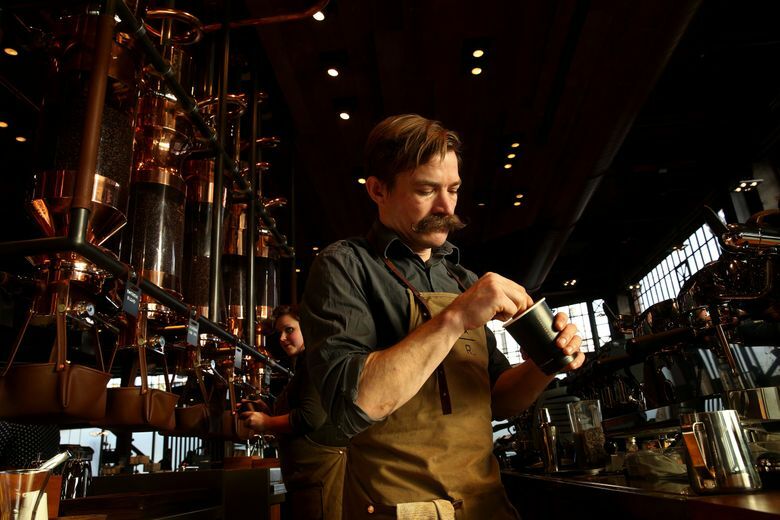 With the Starbucks Reserve Roastery and Tasting Room, it’s putting on a big show. Muller, the Amsterdam-based designer for Starbucks, said that “this is a little snippet” of the future of Starbucks; what’s on view at Pike Street and Melrose Avenue will “inform” further mutations across the company’s realm. The 15,000-square-foot facility also has an important functional element: It will be the main production and staging ground for the Reserve brand, under which Starbucks gathers its priciest coffee beans, which it often sources in small quantities. The store’s launch menu includes El Peñol and Montebonito coffees from Colombia, Cabo Azul beans from Nicaragua and peaberry beans from Sumatra. The beans meant to be consumed sur placeare funneled to the coffee bar, above the heads of customers, through pneumatic tubes. 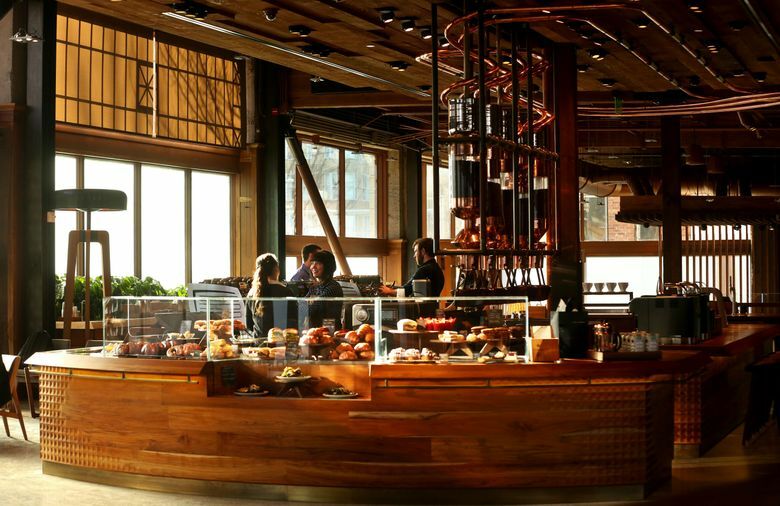 As the coffee beans rattle through the pipes and fall into glass silos above the modern, wraparound bar, they make a sound quite similar to rain. Once there they’ll be ground and crafted into beverages by a rotating cast of Starbucks barista superstars from around the world. Every time a new batch is being roasted, its name and origin appear on an old-fashioned train-station flap display. Muller said she picked it because it felt more authentic than a digital screen, and she liked the sound it made when the letters changed. The space is divided into several areas. 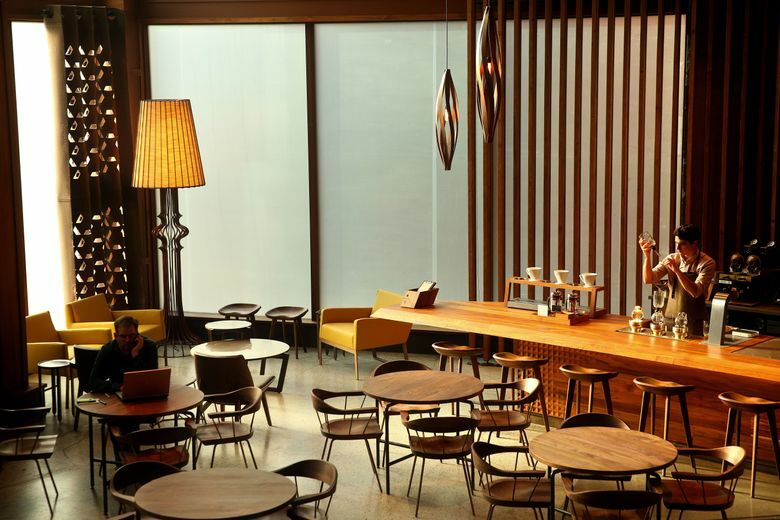 A main bar will be where most people will get their coffee; it’s lower than seen in many Starbucks stores, giving customers a view of the preparation methods for espresso and other drinks, said Muller. There’s also a “scooping bar,” where customers can buy fresh beans.